Think of someone you know who is magnetic. They are attractive, often warm and kind, and their energy electrifies every room they walk into. They have the “IT” factor. They know what they want and who they are and are unapologetic about it. Their certainty in themselves without need for external validation endlessly draws people and opportunities to them. They are the person at the party everyone wants to talk to. On top of it all, they seem to be highly lucky. They are not immune to adversity, but always seem to land on their feet. I’ve made the study of manifestation, magnetism, and human behavior my life’s work. I’m passionate about discovering the art of magnetism – how to develop it, how to use it, and how to benefit from it in every area of one’s life. When I explore the traits of magnetic people, I notice many commonalities, or patterns, in their behavior. The more I researched these Magnetic Models, the more I noticed similarities. The people themselves were completely different. Some were success coaches, some were elite bodybuilding athletes, some were spiritual teachers, others actors, others CEOs and entrepreneurs and others still were people in my social and familial circle. Interestingly, amidst such a diverse cross section, these same magnetism traits kept surfacing time and again. The most common factor to surface, in each of these people, was confidence. When I talk about confidence in this context I don’t mean Ego-based bravado, adopting a mentality that you’re better than or superior to others. I don’t mean a falsified persona that you throw on like a superhero costume around people, or an attempt to project an image of confidence. Think about a fictional character who does this, or perhaps even someone you know personally. They are probably the opposite of magnetic! They might seem confident, but there is just something off putting about them. When I talk about confidence, I mean a confidence that comes when you nurture the core essence of YOU and such nourishment shines through in everything you do, think, and say. I mean a powerful ability to listen to your own inner wisdom and follow it regardless of what society, your peers, family, or inner critic may be telling you. Our core essence is that “IT” factor I spoke of earlier – what is left when one is stripped bare of all their subconsciously programmed beliefs, values, and distortions. It is purity, light, and truth. When someone is living through that essence, they radiate confidence and light up a room the second they enter it. We may notice the energy of the other people in the room shifting also. We are all of us energetic beings vibrating at a certain frequency, which is able to transform, as energy does. If we are in the presence of someone who is radiating at their highest frequency (the frequency of their core essence), it becomes contagious and we feel uplifted too. A magnetic person, of course, cares deeply about others’ feelings, but she doesn’t hinge her every decision, thought, word, and action on what others will think of her. She honours and trusts her own inner compass and follows where it points – even if it is pointing in the opposite direction to what society seems to be dictating. She knows how to love herself and create her own happiness, so she does not need to seek validation and happiness from others. So, why is self confidence such a strongly recurring theme among people who are magnetic? And why is it crucially important to create in oneself? Our ability to manifest something effectively directly stems from our feelings of self worth around having the thing. For instance, you have been trying to call in a higher paying or more highly skilled job, but despite your efforts, visualizing and acting as if, your phone isn’t ringing. My first step as a coach would be to focus on your beliefs around how worthy you feel of that higher paying job. Your confidence in your abilities and self worth affect your consistency, your motivation, and the actions you are prepared to take to call in your desire. On an energetic level, when we raise our self worth, we raise our vibration to meet that of the desire we’re calling in. You may have noticed HUGE changes in your life stemming from one core action, like leaving a dead end job, a toxic relationship or a home your family had outgrown. After making that change in one area, other areas started to shift dramatically. This is because there is incredible magnetism in leaving a situation (or person) that no longer serves you (but where you stayed because you feared uncertainty, or felt just a little too “comfy-cozy”). Taking these big steps shows that you trust the Universe and more importantly, you trust yourself and have the self confidence to know that you are worthy of more. People who have confidence have been shown to appear more sexually attractive, progress more steadily in their careers, are better able to cope with stress and pressure, are better able to influence and lead others, have greater freedom from social anxiety, are more motivated and energetic and are generally happier and more fulfilled as individuals. Why Is It So Hard to be Confident? Our current level of confidence is multifaceted. As important as it is in making us more magnetic and fulfilled, self confidence is something with which so many of us struggle. In part, it stems from karmic hangover and attachment to our past. In other words, a lack of confidence hearkens back from childhood. We were each born as a blank slate. We knew nothing about the world around us. We knew only food, sleep, and unconditional love from our family and the people around us. We knew when we were happy, and we knew when we were sad. Other than that, we were completely untouched – raw, malleable energy contained in a fragile, utterly helpless tiny body. As we got older, our subconscious began to creep in and we started to learn (read more on subconscious mind development here). We learned how to interact with, and behave in, the world around us in order to be safe, loved, and accepted. We unconsciously absorbed emotions and learned beliefs from people we looked up to. Feelings of fear, anxiety, self doubt, criticism, shame, guilt, or chronic perfectionism all have their roots in childhood. Specifically, they are linked with childhood shame, most probably occurring in our formative years between the ages of 0 and 7. Something may have happened to us in our childhood OR we could have made up our own stories/beliefs based on something we saw or observed happening to others. Following such an event, we perceived a lack of love, or belonging, driving us to shrink from that shame. · Because I said so. Even when buoyed by the most loving and confidence nurturing home environment, the game can change for many of us when we reach school. This was my own experience. Even the most resilient and steadfastly confident child can fall prey to bullying. When this happens in formative years it can severely impact our confidence later in life. The school system plays a large role in our childhood conditioning. We are taught to sit up straight, obey our teacher, adopt their thinking methods without question, and are told when we may take breaks and play and when we must work. Fitting in is very much encouraged, and individuality, bending the rules, and being “different” to the other students is discouraged. This prepares us for working in a 9 to 5 job later in life. In any event, when as children we feel shamed, or punished, for expressing our core essence we learn to hold it back. We learn the behavior that is wanted instead and choose it for love, acceptance and safety. This is our “Ego” confidence. In short, our struggle with self confidence, or your core essence, is because we are instead conditioned by society to trust “Ego” confidence. We have learned to adopt this persona when we want to feel validation, belonging, love, acceptance and safety. This is another example of when your subconscious’ intention is in the right place, but it can sometimes pick up distorted views which are less than helpful. Unfortunately, over time, the more we rely on the Ego self over our core essence, the more we began to confuse our Ego for that essence. Rather than feeling safe, validated, and loved, the older that we get and the more we rely on our Ego persona, the less confident we feel and the more we question how loved, accepted, and validated we are. To expand your confidence, and thereby, your magnetism, you need to get reacquainted with your core essence. This can be a difficult and long process. We must first make peace with our childhood and the dynamics of shame conditioning we learned in those early years. This happens naturally, to an extent, as we grow older and learn that adults, far from how they appeared when we were children, in fact do not have all the answers. Nor do the peers who used to bully us or make us feel smaller than them. We’re all just giving it our best educated guess at any given time. Expanding our confidence and trust in our core essence takes time, but it is certainly possible. Sometimes, we can do this on our own. Sometimes, it may be helpful to seek guidance through coaching or counselling. These actionable steps help me through my work with my shadow self and reintegration with my authentic self. The hardest and most important work you will do to increase your self worth is to bring awareness to those parts of you where your self worth is low. Let’s say, for example, your mother was a yo-yo dieter who struggled with her weight, obsessed over thinness, or even made negative comments in passing about other women who were overweight. You may have unconsciously learned that being overweight meant that you would be less loved and/or accepted. As an adult, you yourself may struggle with yo-yo dieting or food shame. Or, you may struggle with overweight even though you eat healthfully and move regularly. Perhaps instead your Sunday School teacher told you that money was the root of all evil, or you were told that people who were financially abundant were crooks, selfish, or greedy. Unconsciously, you might have made that mean that people who were wealthy were not very nice people, somehow ungodly or unworthy of divine love and blessing. You equated being wealthy with something to be shamed, and subconsciously shunned it. As an adult, you might have always struggled to stay afloat financially, even when you were doing all the right things to try and get ahead. As a personal example, I was always an avid reader and a very bookish student. I remember a fellow student constantly teasing me for choosing to sit in the library at lunch time and read books. One day she told me No boy wants to kiss a girl who’s always got her nose in a book. Year by year afterwards, my grades began to slip and I prioritized school work less and less. Around the same time, I had hit puberty and I did want to date boys and be liked by them. Later in my professional life, I have performed well under my own potential and felt so frustrated with myself. Deep down, I knew myself to be a clever, conscientious person. But I couldn’t stay focused and motivated. I would start to study at university and then abandon it before I finished. I ran this (very costly) pattern over and over again. I’d go a few semesters where I would get very high distinctions in all my assignments, and then spectacularly self sabotage and drop out. It was only in my late 20s, as a single woman studying to become a coach, that whilst working with my shadow self I learned to make the connection and finally break that pattern. I realised that in my past I had subconsciously attracted romantic partners who discouraged my academic studies, that is, who confirmed the negative belief and shame I had formulated around being well educated and well read. I had self sabotaged my studies and career advancement because it contradicted my belief: I cannot be well educated, well read and academically successful and also be loved. I had linked those things with not being loved or acceptable, and felt unsafe to express those parts of myself. Today, I have a husband who also highly values staying educated, ahead of current events, and abreast of one’s skills. He likes to have deep, intelligent conversations. He loves to see me pursue professional excellence and follow my passion and is the first person to encourage me to take new courses and up-skill to excel in my profession. Before I was able to call him into my life, I had to work with my shadow self first, to release that shame and elevate my self worth to the same level as the authentic love I yearned to call in. 2. How it served you. 3. How it has held you back. Unfortunately, nobody has invented a time machine so that we can go back and change our past. All we can do now is choose to rewrite our future. We could choose to hold on to that story in our past and let it continue to sabotage us in our lives, and hold us back from the life we’re dreaming of. Alternatively, we can choose a new story. What if our new story involved taking care of ourselves, honoring our own opinions, trusting ourselves, being interested in our own lives, and living authentically and unapologetically? What if we did what we wanted to do because we wanted to do it, not because we felt like we had to? What would become possible for me if I released this shame and was unapologetic, brave, and authentic instead? In the beginning, this is where models can be helpful! We subconsciously like people who are like us, so think to a character on TV or a magnetic, confident person in your life you admire. Subconsciously, you are likely drawn to that element of their personality because it represents that hidden core essence you yourself possess. What would [insert your confidence model here] do/think/have to say about this? With time, you have to rely on this model less and less as you step more fully into your core essence and realize your own personal power. Remember that we teach people how to treat us. If we treat ourselves well, we command that respect from others also. In other words, what happens in the outer world must take place in the inner world first. Want to become more magnetic? Receive your free starter guide with my eBook, The Keys to Manifestation, when you subscribe to the newsletter. Plus receive exclusive content, special offers, and all the latest from the blog. Thank you and welcome to the tribe. Don’t forget to add me to your inbox whitelist or I may accidentally end up in your Spam folder (awkward)!. Your free download is winging its way to you now. What do I need to forgive/release in order to bring this future to life? And then write this sentence: I am willing to forgive and release x and embrace my true nature. This is your new mantra. Whenever you catch the old shame and patterns rearing their heads (and they will, for a long time), repeat the mantra to yourself. Whilst our confidence levels are determined in the developmental years of our childhood, they are not inflexible or unchangeable. We are not doomed to always feel socially awkward, inadequate, or ineffective. I believe that confidence is a skill. 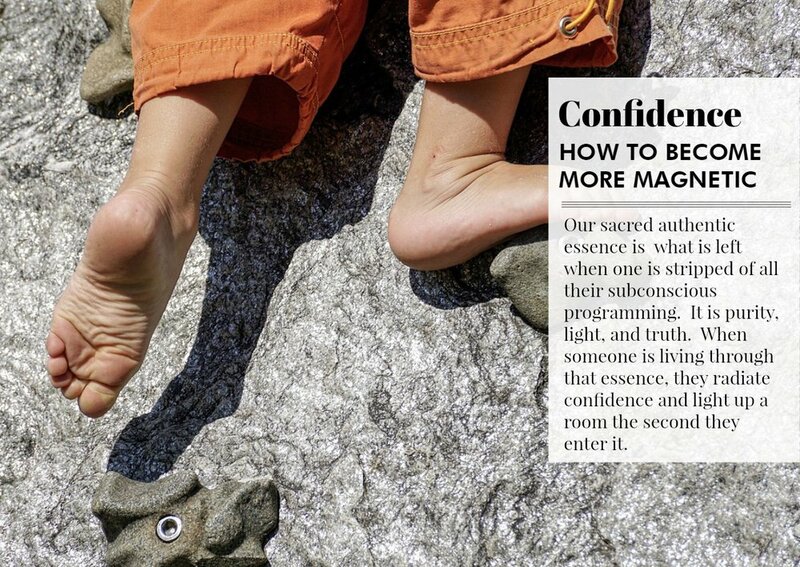 With the right understanding, tools, and perseverance, we can all learn to possess the magnetic confidence that comes from being aligned with our core essence.